Happy World Oceans Day! Today, we celebrate and honor the ocean–its power to sustain life, regulate our planet’s climate, and connect us all. Connected Camps teamed up with the Ocean Institute to activate, not only our campers, but kids and adults nationwide, around both the awe-inspiring aspects of our ocean and the dire need to conserve and protect it for generations to come. Check out the results of our collaboration! Did you also know that 95% of the world’s ocean is unexplored? The ocean, which covers 70% of our planet, is teeming with plant and animal life just waiting to be discovered. 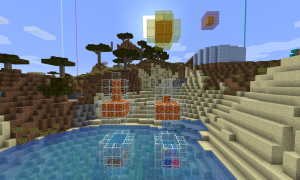 With that astonishing fact in mind, campers in Connected Camps’ Creative Labs tested Mojang’s new ocean patch called Update Aquatic in Minecraft by becoming underwater explorers themselves. Update Aquatic integrates tons of new features, including increased visibility underwater, nine different underwater biomes, underwater treasure, and power-giving dolphins. You can read more about the patch here. Our campers made the most of the new patch by exploring the depths of the digital ocean while discussing fun facts about marine wildlife and ocean conservancy curated by the Ocean Institute. They then brought their learnings to life through creative builds–everything from aquariums to turtle sanctuaries were represented. Campers also reflected on why marine conservation is so important as they explored these new depths; they discussed issues like overfishing and the ways ocean trash threatens the well-being of sea life. One camper created a diagram expressing the relationship between global temperature and ocean health, building two displays, each with a thermometer. In one, the temperature was normal with a vignette of the ocean with vibrant sea life. In the other, the temperature was high with a vignette showing a high sea level, the bleached coral, and far less wildlife living inside. 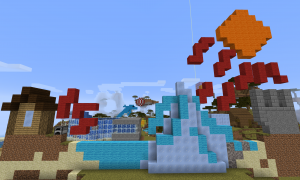 While another created Minecraft infographic on the effects of global warming. 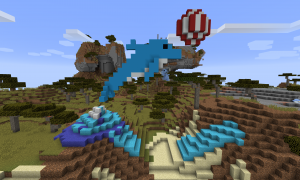 Whether you’re building an underwater world in Minecraft of just like to dip your toes in the surf, it’s important to stop and think from time to time about just how much the ocean gives us. This video is our way of saying “thanks” for everything the ocean provides, including food, transportation, medicine, and even the oxygen we breathe. How will you show your appreciation today? We encourage you to share this video using the hashtag #WorldOceansDay in your own social media posts throughout the day. To top off the collaboration, for every social media share, the Ocean Institute will bring a low-income student from Southern California to its headquarters in Dana Point for a free field trip to visit the ocean for the first time. The Ocean Institute, founded in 1977 as the Orange County Marine Institute, is a community-based organization that educates 250,000 visitors annually through over 60 marine science and maritime history programs. Located on 2.4 acres in the Dana Point Harbor, adjacent to a Marine Life Conservation Area, the facility is an ocean education center that offers in-depth marine science, maritime history and outdoor education programs. It includes state-of-the-art teaching labs, the Maddie James Seaside Learning Center, two historic tall ships, and an oceanographic research vessel. Immersion-based field trips range from one-hour science labs to multi-day programs at sea and at the Lazy W Ranch, in the foothills of the Santa Ana Mountains. 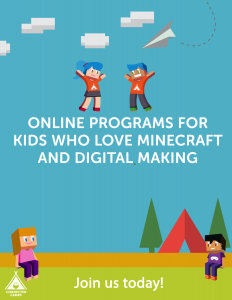 All programs are designed to maximize immersion, spark curiosity, and inspire a deep commitment to learning.